She’s the only woman he can’t charm. He’s the only man she can never love. Dylan O’Roarke has the ideal existence. As a firefighter, he’s been at the top of his game. Even when he’s reprimanded for his risk-taking, the accolades far exceed the censure. Women fall at his feet, and he always has a blond bombshell on his arm. 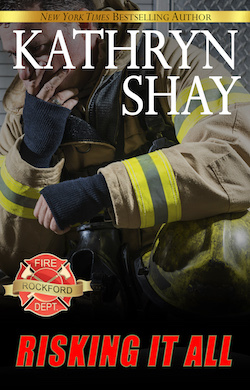 By-the-book Beth Winters does everything with precision and caution in her job as an EMS instructor and recruit trainer, even if she is considered stern and stoic. She has a few good friends she manages to keep some modicum of distance from. Life is best lived on its outskirts, where it can’t wound you so badly you might not survive. The only place the two of them “lose it” is with each other. When Dylan was her student at the academy, she sought out ways to focus on his flaws. And he irritated her intentionally, snidely nicknaming her Lizzie Borden. With eight years of open animosity that rivaled that of the Hatfields and McCoys, they were both grateful when he graduated. Years later, fate throws them together again when he’s assigned as her EMS partner to train new recruits. Working side by side with him, Beth can’t deny his rapport with the students or his warm and giving nature. And Dylan sees the vulnerable side to her, caused by a past that would level an ordinary person. When physical attraction flares between them, they can’t stop their inevitable coming together. Falling in love isn’t in the cards for Beth and she rejects the hand they’re dealt. She can never be part of the family Dylan wants. And he can’t break down her final, indestructible wall. Nail-biting fire scenes, sizzling sexual encounters and the revelation of background that will make you cry buckets permeate this beautiful story of compromise and undying love.